-- The Australian Financial Review's prestigious list ranked Infinity Group Australia as the 58th Most Innovative Company among thousands nominated across Australia & New Zealand. Since being founded by Graeme Holm & Rebecca Walker in 2013, Infinity Group Australia has become one of Australia's fastest-growing debt reduction companies, helping countless numbers of everyday Australians reduce their debt, improve their personal finances, and secure their futures. Now, only five years since it launched, Infinity Group Australia has been recognised by the Australian Financial Review (AFR) as one of the Most Innovative Companies for 2018. This is the seventh year that AFR has published its Most Innovative Companies List (previously called the BRW Most Innovative Companies). The prestigious annual list ranks the most innovative companies from Australia and New Zealand and is the only national, cross-industry list of its kind. The list of the 100 Most Innovative Companies is published in the Australian Financial Review, reaching an audience of over 1.8 million readers. Australia's leading innovation consultancy, Inventium, judged and compiled the list along with a panel of industry experts. Submissions were rated on how well they address the problem they're trying to solve, the quality and uniqueness of the solution and the level of impact that it has in the real world, and its innovation culture, strategy, resources, and process. Infinity Group Australia was selected from over 1,000 companies across Australia and New Zealand assessed by Inventium. Ranking 58th of AFR's Most Innovative Companies list puts Infinity Group Australia in the top 5.8% of all those nominated. Graeme Holm graciously accepted the honor at the 2018 AFR Most Innovative Companies List Awards Night on July 30, 2018. 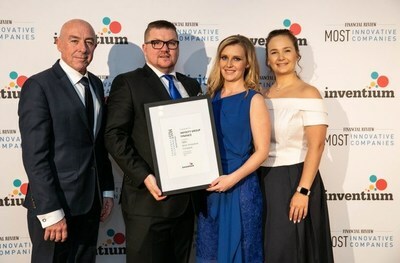 "We are proud to have been listed on the 2018 Most Innovative Companies List, thanks to Inventium and the Australian Financial Review," said Infinity Group Australia founder, Graeme Holm. "Congratulations to our amazing team for their passion for doing things differently! It's an honor to be listed #58 amongst other innovative brands, and humbling that our debt reduction and ongoing budgetary platform and service offering innovation has scored us a spot on the list," he added. Graeme has over 15 years in the financial industry. His passion for keeping the banks honest and helping Australian families one at a time inspired him to launch his own company, Infinity Group Australia. Infinity's goal to be "a personal trainer for your finances" has evolved into a top-ranking innovative company and trusted financial leader in Australia. Based in Bella Vista, New South Wales in Sydney, Infinity Group Australia continues to expand rapidly and in addition to being named an AFR top innovative company, its founder has also been recognised as an MPA Top 100 Brokers nationally and acquired Customer Service Management with IQPC in 2018. The company's commitment to the customer experience is the cornerstone of its success, and the approach produces results: 100% of clients pay more off their home loan in the first 3 months with Infinity Group Australia than they did in the entire 12 months prior with the old bank structure. With guidance and support from Infinity Group Australia, clients eliminate an average of $41,000 in debt within 12 months. Infinity was created to help everyday Australians reduce their debt, create wealth and secure their future. Success comes from creating a relationship with you built on care, integrity, passion, and trust. We believe most families have received a poor deal from financial institutions and we are driven to fix that one Australian home at a time. After spending six months in research and development on problems with the Australian mortgage market, Graeme Holm found a lack of ongoing support, advice, guidance, and services for families. Infinity Group Australia changes this approach, providing a personal banker to help clients pay their loans off as quickly as possible. Clients receive monthly performance reports, detailed reviews, and assistance in developing and maintaining budgets to ensure their success. The award-winning Infinity Group Australia offers services in debt reduction, wealth creation, and retirement solutions. For more than 50 years, The Australian Financial Review has been the authority on business, finance and investment news in Australia. It has a reputation for independent, award-winning journalism and is essential reading for Australia's business and investor community.